Please be informed that we will have pipe connecting works at the main water distribution system from Wednesday, 13 February at 9 PM to Thursday, 14 February 2019 at 3 AM. Please keep some water in your storage and our water truck will be on standby for your urgent water requirements. Please call our Emergency at 0800 1900 911 for assistance. When the water supply is back to normal, please do remember to let the taps run for a while before use. In view of the upcoming 2019 Election of President and Vice President of the Republic of Indonesia which will be held on April 17, 2019, we are advised that you may now check your name in the 2nd revised Voters List (Daftar Pemilih Tetap Hasil Perbaikan/ DPTHP) at your local government (Kelurahan) or via online website : https://lindungihakpilihmu.kpu.go.id/ or send a photo of your Identity Card (KTP) via WA : 0813-1615-9494 (KPU). However, if your KTP is registered outside of Lippo Village and you wish to vote in Lippo Village, please process the vote transfer location at the designated Kelurahan at the latest on Friday, 15 February 2019. Please contact our Call Center at (021) 55 777 557 if you need further information. 1) The program valid from 1 February to 30 April 2019. 2) Passengers of External Shuttle Bus Lippo Village to Jakarta who rides the car and park at public carpark Maxx Box LV only, instead of VVIP area. 3) Only registered cars enter the system through the access gate of Jl Bulevar Palem Raya (next to Taman Buah, Taman Sari). 4) Use OVO to pay the parking rates. 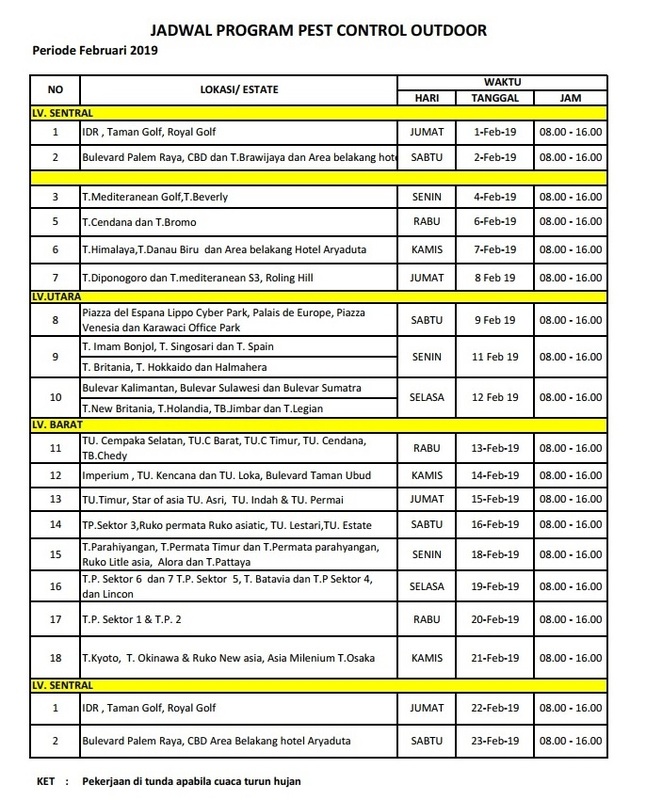 Below, please be informed for the new schedule of External Shuttle Bus of Lippo Village. Now we’re still continue to review the bus capacities and ridership, as well as trying to improve the services and shall keep you updated on the profess of transportations provided in Lippo Village. Thank you for your support and trust in us. 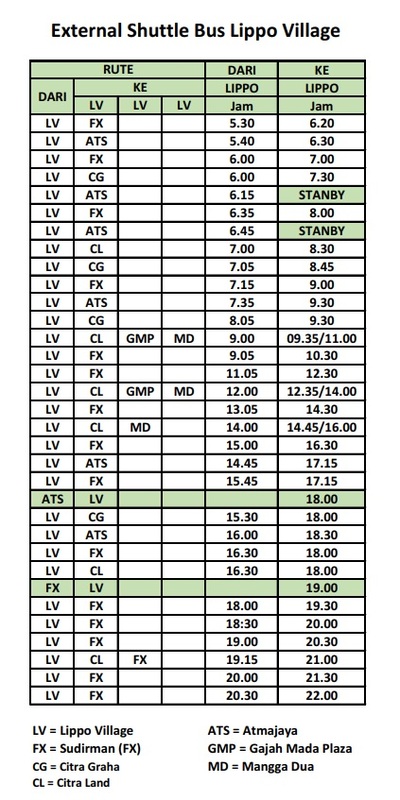 The program will be implemented starting on Friday, 1 February 2019 (please see below schedule).